With two new year-round releases from Sierra Nevada this year (Torpedo and Kellerweis), it came as no surprise that one of their existing beers was going to have to bow out in order to make room. And with the incoming Kellerweis also being a Wheat beer, the choice to discontinue the relatively poor selling Wheat Beer only made sense. Having never actually tried Sierra Nevada Wheat Beer, I decided that I had to try it before it was too late when I heard it was getting the axe. While there wasn't much stock left on the shelves here in Houston, I was able to find a couple of six-packs to sample. Pale, smooth, and light-bodied, Sierra Nevada Wheat Beer is brewed from premium malted wheat and light barley malts, utilizing our traditional ale yeast. This unfiltered ale is finished with the characteristically spicy Strissel Spalt hops from the Alsace region of France. Sounds like good stuff. Though it may be a bit of a moot point now, let's pop a cap and see what made Wheat Beer tick. Appearance: The body is crystal-clear and pale straw in color. But the star of the show is a monstrous, luxuriant head that leaves awesome curtains of doily-like lace and endures until the bottom of the glass. Beautiful. Aroma: A pale wheat base with decent hops and some hints of citrus. It's pretty thin overall. Taste: It's much the same story in the flavor profile. A pale, somewhat bready wheat body with a nice citrus kick and decently bitter hops. Quite mellow, but much more intense than the nose. Mouthfeel: Medium-bodied with average carbonation. Just short of dry in the finish. Drinkability: Absolutely top-notch; perfect for grilling on summer's day. 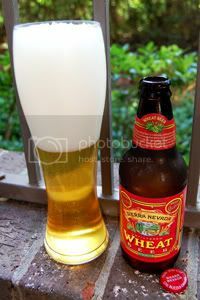 Verdict: Sierra Nevada is a solid, tasty Wheat beer, and I'm sad to see it go. Sure, it may not be the most exciting beer in the lineup, but it will be missed. Godspeed. Note: While this review is being published in June, the tasting notes contained within were taken when the beer was fresh this past April.